Daiya Fude Face Duo from Shiseido is a brush with two applicators that has a gel tip that mimics the effect of the fingertips and a red diamond cut brush that is designed to spread. The gel applicator has a second end which is shaped like the fingertips without absorbing the product such as a traditional sponge. 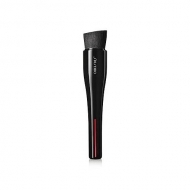 Hygienic and easy to clean, this applicator fits the contours of the face to create great coverage. 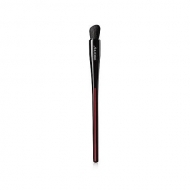 The red head of the diamond-shaped brush looks silky but contains a large volume of dense fibers at its core to maintain its shape and provide the perfect balance of strength and flexibility. This ergonomic brush is compatible with creams, powders, liquids and gels. Each brush is handmade in Japan by a team of skilled craftsmen.